Early Settlers Many of the early settlers (1820-1827) of Bee Branch Township were from Kentucky, Virginia, Michigan, and Illinois. Historical information indicates that Chariton County was settled later than many counties because much of it was given as land grants. Early founders of the German-Catholic community later known as Wien lived in the Wien and Thomas School Districts, established at least as early as 1870. One of the earliest German Catholic settlers in the area was Casper Long who lived in the Thomas School District, just south of present day Wien. Following is a listing of the earliest settlers to the area eventually known as Wien. Most of the information is taken from the 1870 Wien School Enumeration Listing which can be found under Historical Pictures on this website. Pictures, histories, obituaries, and descendants will be posted as they become available. In the June, 1870 census, Albert Seaman is listed as a 56 year old male farmer from Baden. His wife, Margaret was 48 and three children are listed: Albert (12), Mary (15), and Terresa (9). All were born in Baden and the two girls had attended school within the year. No property is listed, but Adelbert is listed on the 1870 Wien tax enumeration. David is listed in the 1870 Wien school enumeration. The 1870 census shows him to be 47 years of age and a farmer with property born in Virgina. His wife, Sarah (48)was born in Ohio. Children included William R. (20), who worked out, Lafayette (17), Ellis (15), Clarissa (13), Mary (11), Viola (8), and Alicia (6). All were born in Michigan. Lafayette, Ellis, and Clarissa had attended school. Thanks to Bertrand Macpherson, we have some updates on David's family. David's name was actually McPherson. He was born in December 1822, Loudoun County, Virginia, and was raised in Knox County, Ohio. He married Sarah Scribner in Ohio, where she was born in 1822, and they moved to Clinton County, Michigan in 1848. All of their eight children were born in Michigan. One, Clotilda, died a few weeks before they left for Missouri in 1868. The remaining children were Wilton (not William), Melville Lafayette, Ellis (Bertrand's grandfather), Clarence (not Clarissa), Mary Louise, Viola Josephine, and Alice Arletta. David's family stayed a short time in Chariton County, then moved to Moberly, Missouri where they lived for about four years before moving to Cowley County, Kansas, where David died in 1899. The second listing on the 1870 tax enumeration is "D.F. Bagereau(?)" which is probably David F. Badero who is listed in the 1870 census as being a 42 year old farmer with property who was born in Canada of American parents. His wife, Mary (35), was born in Ohio. Children included: Francis S. (14), and Mary J (10), both born in Michigan. Martha E. (9) and Phoeba (7)were both born in Missouri, and Della (5) was born in Iowa, while Florence (3) was born in Missouri. Although listed in the Wien tax enumeration for 1870, William could not be found in the BeeBranch Township census for 1870. Perry Brennan was listed in the 1870 Wien tax enumeration and on the 1870 census, where he was listed sequentially between Orville George on one side, and David Sivermone on the other. Perry is listed as a 37 year old farmer with property from Michican. He and his wife, Frances (34) were both born in Ohio and had Ella (8) born in Wisconsin. Wolbert, is most likely a Holbert,although both the tax enumeration and census appears to begin with a "W". He is listed as a 25 year old farmer with property from Indiana, and is listed between David McPerson and Tobias Miller. Wobert's wife, Mary E (26) was from Missouri and both of their parents were born in the United States. Children were listed as William F. (9) and James A (7 months of age). Tobias Miller was listed in the tax enumeration and the 1870 census. He was a 27 year old farmer with property from Indiana, living beside Wobert Miller. Tobias' wife, Muicho J (21)was born in Missouri, as was Anna E, age 2. James is listed as Kanada on the tax enumeration, but is probably the James Kennedy that is listed in the census as living between the Sivermone(?) and Jackson Collett households. Within the Kennedy household are other enterprising young men listed also. James is listed as a 23 year old farmer with property, who was born in Ohio. His wife, Frances was born in Iowa with parents born in the United States. Also living in the house were David King (listed below), Rici St. Janes (22), a farmer born in New York with foreign born parents, and David Morries or Morris(listed below). Daniel is listed both on the tax enumeration and on the 1870 census. He is aged 29 and listed as a farmer with property from Michigan. His wife, Catherine was 20 and from Ohio, and their 3 year old Amelia and 1 year old Clara were both born in Missouri. David Morris is listed in the 1870 tax enumeration, and is also in the township census. He was 19 in June, 1870 and was living with James Kennedy and his wife Frances and with several other young men who were "farmers" and owned property. David was born in Wales of foreign born parents. John King was listed on the 1870 tax enumeration and in the 1870 census. He was 48 and was a farmer with property, born in Maryland. His wife, Sarah (35)was born in New York. 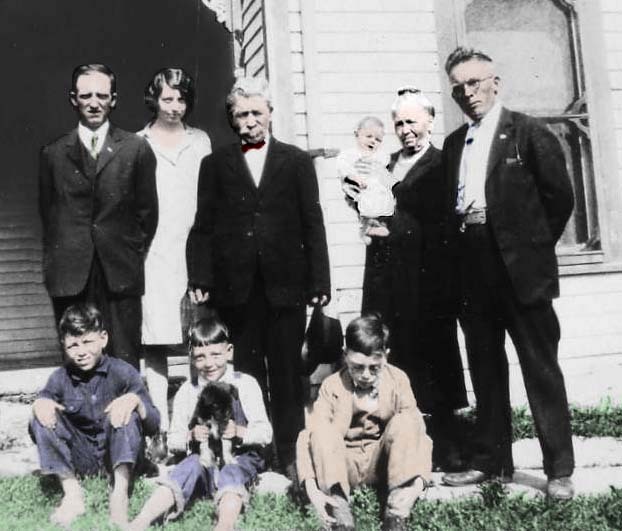 Children included John (16), Frank (14),Victer (12), Mary (7), all born in Illinois. Also listed is Flora (3), and Jane (1), both born in Missouri. Although being listed on the tax enumeration for 1870, David could not be found on the 1870 census. Samuel is listed on both the tax enumeration and the 1870 census. He is listed sequential after David F. Badgero and before Emily Andrew. He was 55 years of age and was a farmer with property , born in Pennsylvania. Samual could not read nor write and may have had some kind of disability. Jane Clark (36) kept house and was born in Tennessee. Megg (13)was born in Missouri and had attended school within the year. Samual (9)was also born in Missouri but had not attended school within the year. Mrs. Andrews is listed in the 1870 enumeration, and is listed in the 1870 census as Emily Andrews. She is listed after James Thomas (a teacher)and before John Riso (? )and McPerson. Mrs. Andrews was 37, and had been born in Ohio. Also living in the household are Rollino (?) a male of 10 years, Coreli-a (?) age 8, Auther L (4), and Ernest L (4) who are twins born in Missouri. Orvill is listed in the tax enumeration while the census looks like "Oville" George. Orville is 26 and was a farmer with property, born in Michigan. His wife, Alvera (25) was born in Ohio. Anna (4)was also born in Ohio. Lucinda (2) and Justin (4 months)were both born in Missouri. Edwin George (20)was a farm hand also born in Michigan. The family is listed after Oscar George and before Perry Brennan in the census. O.P. George is listed in the census as Oscar George. He was 52 and was a farmer with property born in Ohio. His wife Eliza (44) kept house and was born in Canada. Children were Mansel E (17) a farm hand, William (13)and Eliza J (16). The two boys were born in Michican and Eliza was born in Iowa. Jackson Collett was listed on both the enumeration and the census. He was 38 and was a farmer with property. He and his wife Dicia (40)were both born in Missouri. Children included Elizia (14), William (12), John (3), and James (7). Anton Huber arrived in the area about 1870. (An obituary of his daughter indicates April, 1872.) He was born 2 August 1827 in Eichendorf, Bavaria, and came to the United States in about 1852. He married Helena Schmeltz/Schmelz on 19 September 1853 in St. John, Lake CO, Indiana. Her birthdate was 20 December 1826 and she died in Wien on 3 February 1915, and was buried on February 5 by Fr. Jacob Kagerbauer. Anton lived north of Wien, and donated land in 1876 to the Franciscans to be used for the new monastery. His children included Maria Anna Huber b. 22 April 1854, Maria Afra Huber b. 17 May 1857, Joseph Huber b. 11 August 1859, Theresa Huber b. 2 December 1861, Magelina Huber b. about 1865, Aloisa Benedicta b. 23 August 1866, and Michael Huber b. 17 December 1869. Baltasar WEHNER (and his wife Anna Maria HALFMAN) came to Chariton County with their daughter (Mary Ursala) and her husband, Peter STEPHENS sometime between 18 April 1870 when the latter two were married in Lake County, Indiana, and 27 May 1871, when their first child (John Ferdinand) was born in Chariton County. Baltasar was born in W�lfershausen near Schweinfurt, Bavaria, on 9 March 1819; Anna Maria was born in Dockweiler, Rheinland, Germany, 18 November 1828. They lived in the Wien area until their deaths, 24 August 1895 and 20 August 1898, respectively. They had 10 children: John, Ursala Mary, Margaret, Joseph Baltasar, Willie, Ottilia, Anna Maria, Mary, Henry, and George. Peter STEPHENS was born Jean Pierre ETIENNE 16 November 1841 in St. Avold, Moselle, France. Shortly after arriving in Missouri from France in 1861, he enlisted in the Union Army. His wife was born in Lake County, Indiana, 26 December 1951. They had seven children (Hone Ferdinand, Anna Mary, Katherine Cecelia, Joseph Pierre, Pierre John, Mary Barbara, and Elizabeth Gertrude), all born in Chariton County. Peter and Mary STEPHENS left Chariton County sometime after the turn of the twentieth century, migrating to western Kansas. He died in Angelus, Kansas, 12 January 1923; she died there 17 July 1934. Joseph Abraham and his wife Augusta Jaworski, came to Wien in the 1880's when his daughter Elizabeth Abraham was 2 years old. 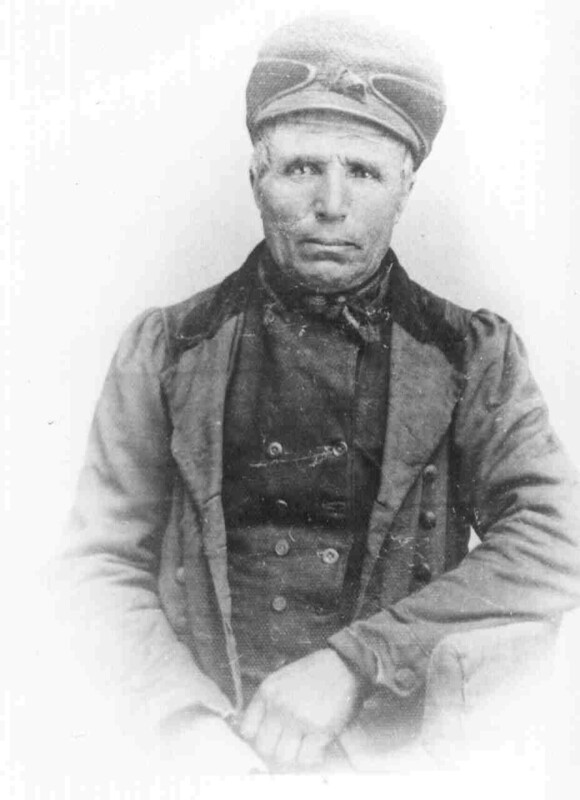 Joseph had been a blacksmith in the Prussian army and after moving to Sparta, Illinois heard that Wien needed a blacksmith. He had met his first wife in Prussa (in the area that is now Poland). 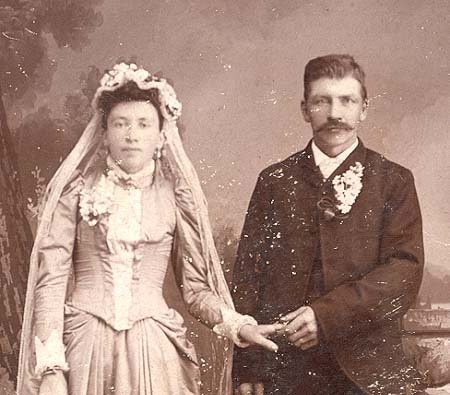 After the death of his wife in January 1890, he married Mary Anna Noll (pictured in the photo) on April 7 1891. They continued to live on the Abraham farm and their daughter, Mary Anna (Mazie) married Joseph Biegel and stayed on the home farm. By 1873, much information was being disseminated about the wonderful traits of Missouri and of Chariton County in particular. These documents included a book or booklet by Munch, a newspaper advertisement by Hosmer & Comstock, and an "Immigrant Handbook for Chariton County" authored by Louis Benecke, who is believed to be a second generation American of German descent. Further information about these documents will be posted as they are obtained.